We are very nearly ready for this season’s All-Star Game. Now that the rosters have been announced, it’s mostly academic. We’ll have the annual injury replacements and then the pitcher replacements and, of course, the Final Vote. By the time they line up along the bases for intros next Tuesday, many of the players who were originally denied a roster spot will have found a place by other means. That’s the nature of this process. Let’s take a look at what this year’s game is likely to offer. It strikes me this year, as I scroll through the leaderboards, how few deserving players have been omitted from the initial rosters. In the National League, there are a couple of big snubs in Justin Turner, Anthony Rendon and Alex Wood, but Turner and Rendon are candidates for the Final Vote, and Wood is a good bet to make the roster, especially if Clayton Kershaw starts on Sunday and thus becomes ineligible to pitch in the ASG. In the American League, two of the players at the top of the leaderboards are also on the Final Vote list in Logan Morrison (ninth in WAR as of Sunday) and Xander Bogaerts (11th). In between them at 10th is Aaron Hicks, who wasn’t selected either for the roster or the Final Vote. Ditto for Lorenzo Cain, who was behind Bogaerts in 12th place as of Sunday. On the NL position-players list, between Rendon (fourth in WAR as of Sunday) and Adam Duvall (19th), the only player not included on the roster is Freddie Freeman, who is excellent but has played in just 37 games this season. Hard to get worked up about that. 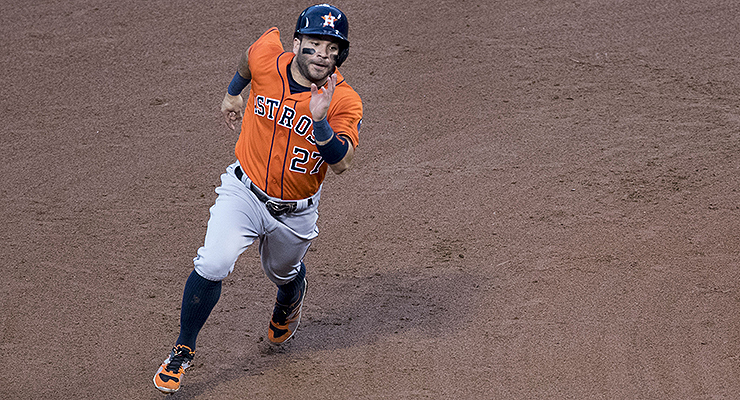 There’s a good chance that Jose Altuve will be the first batter of the 2017 All-Star Game. Among AL pitchers, Chris Archer stands out as a snub, but he’s not really a snub by traditional metrics. His 3.07 FIP is marvelous; his 3.92 ERA, less so. But he also has 131 strikeouts, which is the second most in the AL, and fourth best in baseball behind only Chris Sale, Max Scherzer and Kershaw. One would think, in the age of the strikeout, that this would be enough to get him on the roster. It still may, though, so before I get too worked up, let’s see what thing week brings. Of course, there are other ways to look at things. Just because most of the players at the top of the leaderboards are represented on the team doesn’t mean the process was perfect. I’m not sure what Michael Brantley has done to deserve a place on this team other than being on the field for the majority of the season. He’s sort of a feel-good selection in the sense that, prior to this season, it was natural to wonder if he’d ever play at an average rate again, and I’m thrilled that he is. But he’s playing at roughly an average level, and his spot would have been better utilized to select Cain, Hicks, or a half-dozen other players. Brantley ranks 19th in WAR among AL outfielders, and 13th in wRC+. He’s hit five home runs. It’s not like he’s setting the world on fire. If you want to limit it to just left fielders, you might consider Brett Gardner, who has more than double Brantley’s WAR and three times as many home runs. Nelson Cruz also sticks out as an unworthy choice overall, though he’s been one of the better DHs, so he fits positionally. One of the quirks of the process is those position limits. It’s understandable that there should be a certain number of players per position, but in years when one position is really strong and another isn’t, you end up with some head-scratching results. Such was the case in the NL this season: third base is incredibly deep and second base just isn’t. The imbalance between the two positions is probably best illustrated by the appearance of DJ LeMahieu on a roster that excludes Kris Bryant. At the risk of boring you into sleep, this is where I note that the way the roster selection works is that, if the players and the fans vote for the same player to start at his position, the backup at that position is automatically awarded to the person the players vote into second place. In this case, that was LeMahieu. LeMahieu has developed a great reputation since he started hitting .300. He hit .311 in the first half of 2015 and, as a result of that, was named to his first All-Star team. Then he went out and hit for the highest batting average in baseball last season, as his .348 AVG just edged out Daniel Murphy at .347. LeMahieu was legitimately good last season overall, as his 4.2 WAR shows. But in 2015, and this season, he hasn’t really been all that great. His 0.7 WAR ranked 16th among NL second basemen as of Sunday. His 82 wRC+ ranked 23rd. By total offensive runs (Off), he ranks 42nd out of 45 NL second basemen. Yes, he’s hitting .303, but it’s a pretty damn empty .303. Bryant’s omission highlights the problems that can occur with the roster-construction process. Fan voting to decide the game’s starters is a good foundation off of which to build — as is the one-player-per-team rule. I’d submit, however, that the process should have few other constraints beyond that, especially when it comes to the player vote. MLB should have the wiggle room to step in and say, “Hey, you know that awesome, handsome player who was featured in one of our best recent ad campaigns, hit third for the NL All-Stars in last year’s game, won the MVP award, and made the final out to help deliver his team its first World Series championship in more than 100 years? Yeah, that guy needs to be in the All-Star Game.” In other words: while it’s important to give interested parties a vote, it’s also important for Major League Baseball to have some freedom to create the most compelling game possible. Despite all the roster debate and Bryant’s omission, MLB’s jewel event of the regular season is going to be a good show, at least at the start. Jose Altuve will likely lead off the game against Max Scherzer, and in the bottom of the first, we’ll likely see Chris Sale face Bryce Harper for just the third time ever. (Their only other encounters also came in the All-Star Game. In 2013, Harper lined out to third, and last season, Harper grounded out to second). The process isn’t perfect, and the game itself is unlikely to be perfect, but there is a lot to love here. I’m excited to see Aaron Judge and Cody Bellinger under the bright lights for the first time, I’m excited that overqualified reserve players like Mookie Betts, Francisco Lindor, Paul Goldschmidt and Corey Seager will make for a more exciting middle of the game than we’re accustomed to, and I’m excited to see if the game comes down to Kenley Jansen versus Craig Kimbrel. Also, just for your viewing and commenting pleasure, I’ve constructed several custom leaderboards for the game. Enjoy! We hoped you liked reading This Is the Post About the All-Star Rosters by Paul Swydan! I can’t really see why the Dodgers should have to give up c. 0.15 of a win just because Kershaw is so awesome. Agreed, it’s an exhibition game. There’s no reason a team should have to adjust pitcher usage on games that count for this.